Cary sampling the southern sun and the desert terrain around Hurricane, UT. Cary enjoying the descending on his new BMC Trailfox. Cary and Jackson ex-pat Amanda Carey on the top step of the podium! The 6 Hours of Frog Hollow in the desert outside of Hurricane, UT, is a great excuse to head south and log some miles on the dirt. I was obviously not the only one from Jackson or Teton Valley to think that as we were well represented on the starting line with at least a dozen of my neighbors. The course is also very early-season friendly with only 975 feet of climbing over the 13.5 mile lap. 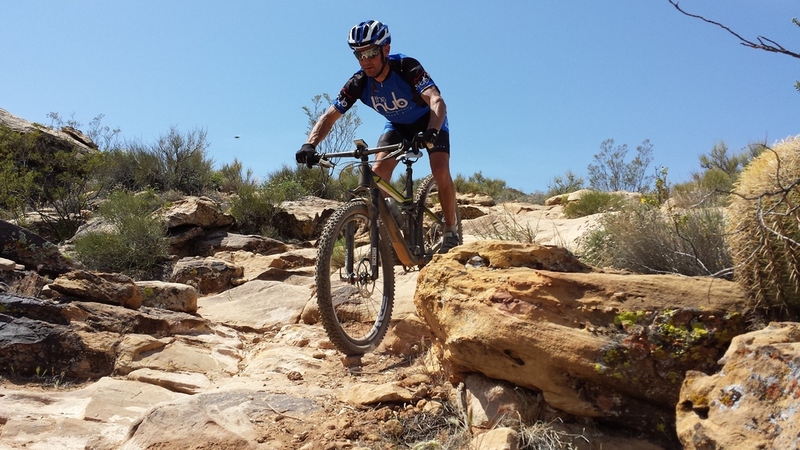 The majority of the climbing takes place in the first 5 miles then it’s mostly down or flat for the rest of the lap, incorporating part of the Jem Trail and some freshly cut, twisty desert singletrack. Amanda Carey (Liv-Giant) wanted some high intensity training before heading to the Whiskey 50 next week, so she suggested doing the race as a duo. I jumped at the opportunity and weaseled my way into a corner of Kim Beres’ truck for the ride down with Kim, AJ Linnell and Tracy Petervary, who spent the drive checking updates from her husband Jay’s Spot tracker as he suffered along the 750 mile Arizona Trail Race. There was not much intrigue from that race as Jay had opened up a 100 mile gap over second place by 2/3 of the way through the race. Amanda generously offered the first lap to me, meaning I would have to run the few hundred meters to my bike off the start line since this race continues the silly tradition of a LeMans start. Little did I know that this run would only be a warm-up for things to come. My race started well enough, with me getting on my bike first and leading the pack out the dirt road. I was joined by Chris Holley (Kuhl), who was also racing as a co-ed duo. He and I traded pulls up the 20 minute climb, going full gas. Since I was on a singlespeed, my only hope was to open a gap on the climb since I knew I would be spun out on the flatter sections. Not surprisingly, he didn’t let me get away and we had a blast railing the first part of the Jem trail. I let him by when the trail flattened and he pulled out about a minute on me. Just as I was telling myself to loosen up and let my bike roll on the short descents I nailed a sharp rock with my rear wheel, immediately covering myself in sealant as my tire went flat in about five seconds. I was only about a half mile from the finish so I decided to run it in rather than install a tube. Here’s where my short run at the start paid off since it was the only running I have done all spring. Still, I was passed by four racers before I could hand off to Amanda. She immediately worked her magic, storming out of the pits like a woman possessed, quickly passing KC Holley to re-take the lead in our class, and setting the fastest lap time of the day for the women. After changing my tire, grabbing a bite to eat and relaxing for about a minute, I started my second lap. Amanda had given us enough of a cushion that we were able to finish three laps each without being challenged for the lead again. Overall, it was a good day for our local racers as we won the co-ed duo, AJ Linnell notched another singlespeed win and Brooke Saindon was on the podium in the women’s 50+ category. Frog Hollow is a scenic and fun course with very few technical challenges. If this sounds like your cup of tea and you don’t want to wait until next April, sign up for the 25 Hours of Frog Hollow that takes place on the weekend of the time change back to Standard Time. I can guarantee that you will see plenty of familiar faces from our area.